GReads! : Sweet Summertime Reads Roadtrip with Danielle! Sweet Summertime Reads Roadtrip with Danielle! Hello, and welcome back to another edition of Sweet Summertime Reads Roadtrip! Each Wednesday this summer I'll be taking you on a virtual roadtrip to various places on the map and hopefully introduce you to some new reads along the way as well. This week concludes our roadtrip as we make our final stopping place in Kentucky, where Danielle from Love at First Page will be showing us around her hometown. When Ginger first asked me to be a part of her Sweet Summertime Reads Roadtrip I of course immediately said yes. I know Louisville (Loo-a-vul) isn't the first city anyone would think to visit when traveling across the United States, but I love living here. As the last stop of the tour I'll do my best to show you why. 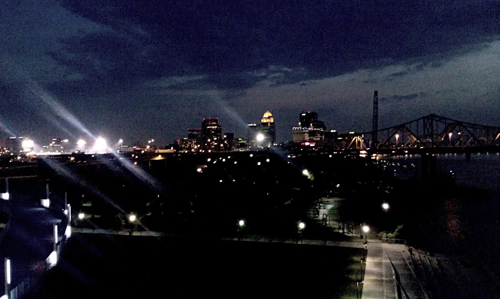 I was born and raised in Louisville, living elsewhere only during college and for a short time afterward. But I couldn't stay away for long. I like it because it's not too big but not too small either. When people think of Kentucky they probably picture beautiful farmland, horses, and open sky. While that's certainly true, it's not exactly the Kentucky I grew up in. I'm a city girl through and through. 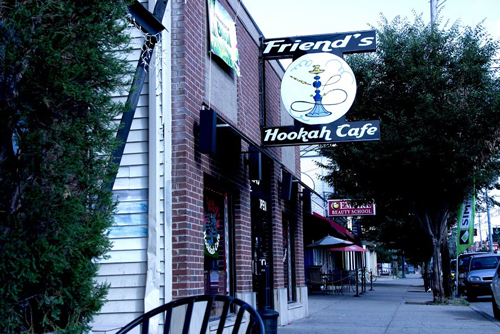 There are two main areas of Louisville that are really popular: downtown and Bardstown Road. Downtown we have 4th Street Live, which is basically a short street that has tons of dining and entertainment venues (like bowling, live concerts, and karaoke bars). It gets especially fun during the holidays - everyone dresses in outrageous costumes for Halloween. If you want something a little less wild, there's the newly renovated Big Four Bridge, which stretches across the Ohio River. 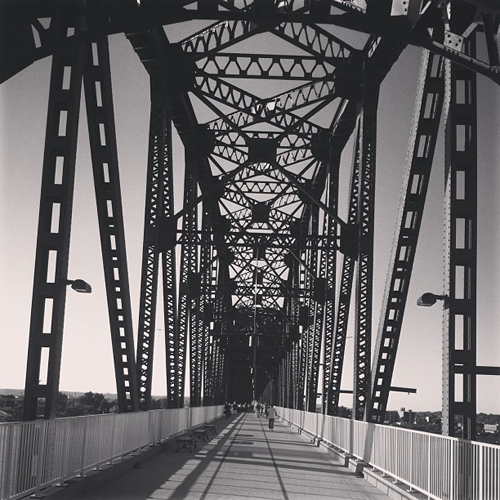 You can walk or bicycle across it, with a gorgeous view of Downtown Louisville. The Waterfront Park (right below the bridge) is also a nice place to relax (and read, if you're like us). Bardstown Road is more for the artsy crowd. Tattoo Parlors, local restaurants, vintage clothing and jewelry stores, and indie music stores dominate the area. 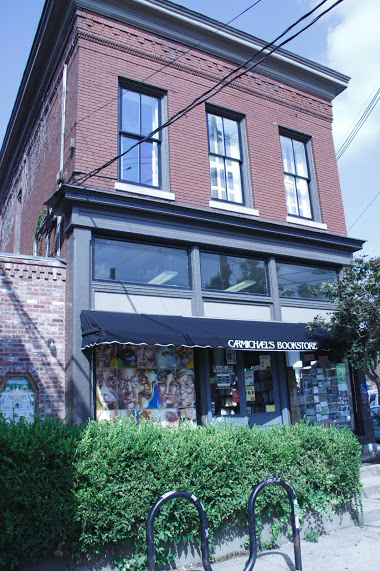 One of my favorite bookstores I like to visit is located there - they sell fun magnets, bumper stickers, t-shirts, and notecards in addition to books. One thing is certain about this city: you can't escape from college sports. 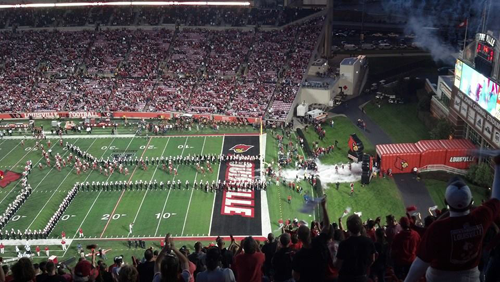 We don't have any professional teams in Kentucky, but our UK and UL fans are some of the most dedicated. It's also a really awesome rivalry, especially with basketball. 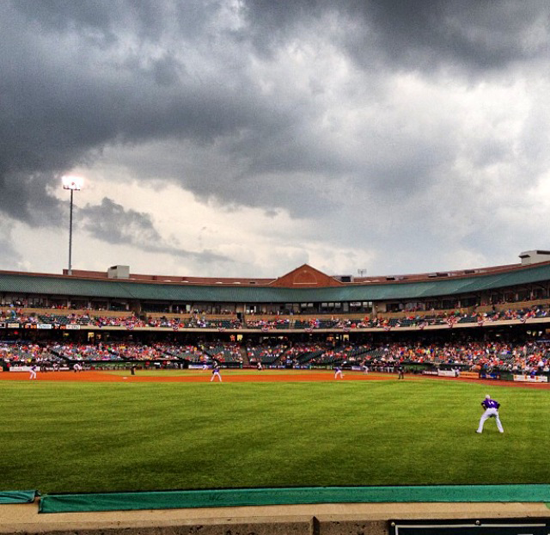 Depending on the season, going to a football game at Papa John's Cardinal Stadium or a basketball game at Rupp Arena (which is in Lexington) is a great way to feel the spirit of Kentucky. (For the record: GO CATS!) 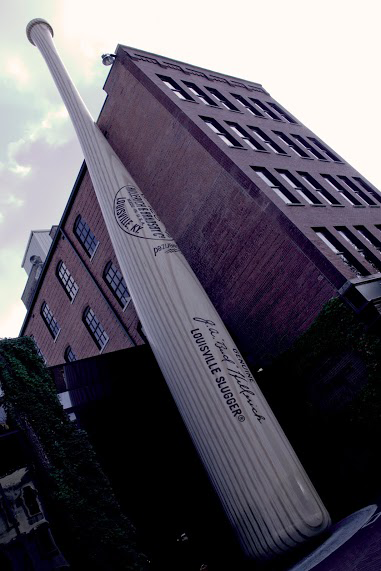 There's also Louisville Slugger Field (home of the River Bats) and Slugger Museum (which makes the bats for the MLB teams) if you like baseball. 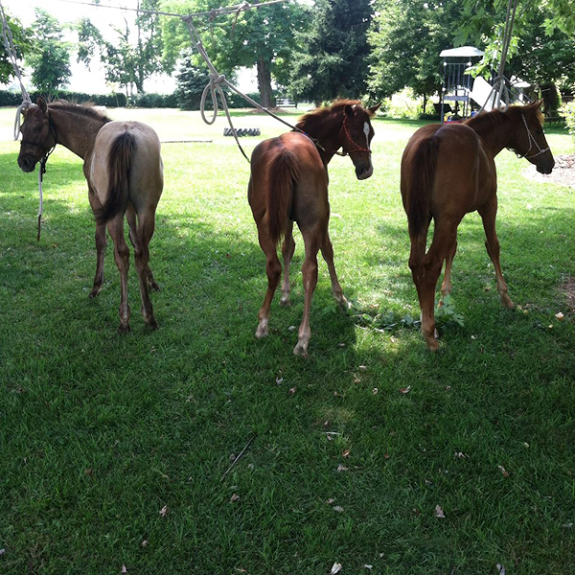 I'd be remiss if I didn't talk at least a little bit about what people associate most with Kentucky - horses. One place you can visit (picture not included) is Churchill Downs, where the Kentucky Derby is held every year. My husband actually grew up on a farm right outside the city of Louisville. His parents started a nonprofit organization called Stormhaven Youth Ranch, where they pair horses with troubled kids who need to find healing in their lives. It's an amazing program that I've gotten to witness grow over the last few years. Racing Savannah by Miranda Kenneally - it's not set in Louisville, but the characters make visits to a few of Kentucky's famous horse racing stadiums, including Churchill Downs and Keeneland. You can't write a book about horse racing without mentioning the Kentucky Derby. :) Like all of Kenneally's books, she researched the sport really well. The bond Savannah has with horses is something I've seen firsthand with my mother-in-law. Pushing the Limits series by Katie McGarry - these books are set in and around Louisville, seeing as the author grew up here as well. Amy & Roger's Epic Detour by Morgan Matson - how could I not mention this book?! A) it's about a cross country roadtrip, and B) one of their stops is in Kentucky. They visit the Brown Hotel at one point, famous for it's Hot Browns (they are indeed yummy! ); if you're looking for a place to eat that's on the fancy side, you can't go wrong there. Thank you so much, Danielle, for showing us around Louisville (in my head I am trying to pronounce it correctly, ha!). I have never been to Kentucky, but have always wanted to visit. It has the feel of southern charm, which I consider home since I'm from the south, yet there's a vibe that makes it stand out from others with its culture and history. 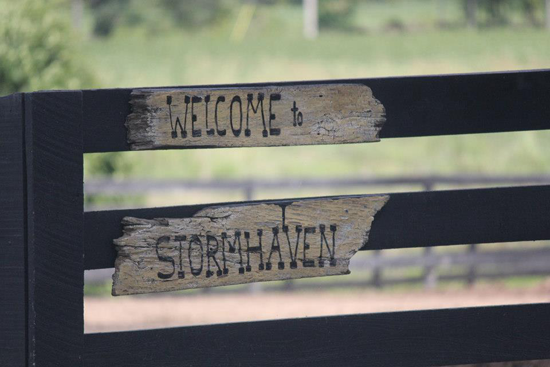 Your in-law's horse ranch, Stormhaven, sounds amazing. I love hearing about places like that. Well, this concludes my summer-long series! I hope you've enjoyed all the fabulous destinations we've ventured to over the last three months. I want to say another huge thank you to all the bloggers who participated. You helped me show my love of traveling through reading and for that, I am so grateful! I hope my readers have discovered new books to read, added places to see to their bucket lists, and found a new blog to follow as well. Another summer has come and (just about) gone. Hope you've enjoyed it! I've actually always wanted to go to Louisville and this post just makes me want to go even more! 4th Street Live sounds like a blast and those horses are soooo sweet! Thanks so much Ginger for such a great summer feature. It was so much fun taking part in it, but mostly to see all of these amazing places that I'm now wanting to visit! Ginger, love this feature! so much fun. Danielle, I really really want to visit you in Louisville! (and yes, i'm pronouncing it out loud the right way right now, haha). 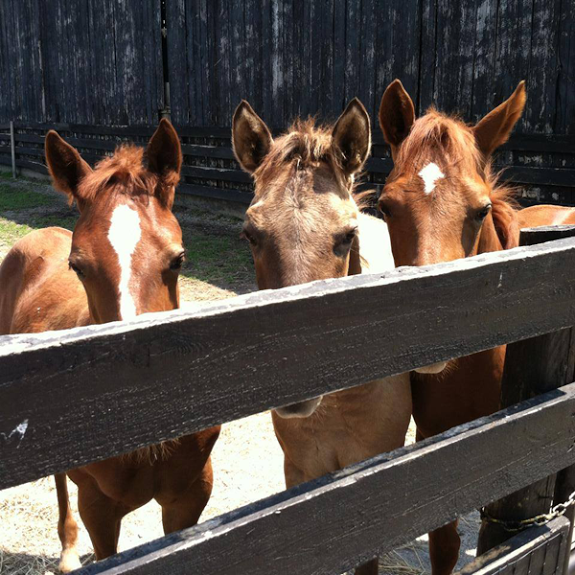 So.. as a kid i was obsessed with horses and all things kentucky. I even chose kentucky to do my 5th grade state report on! haha. That's awesome that your husband's family does that! I spent some time when i was younger working with kids at a therapeutic riding center and it's amazing how it's affected the kids' lives! 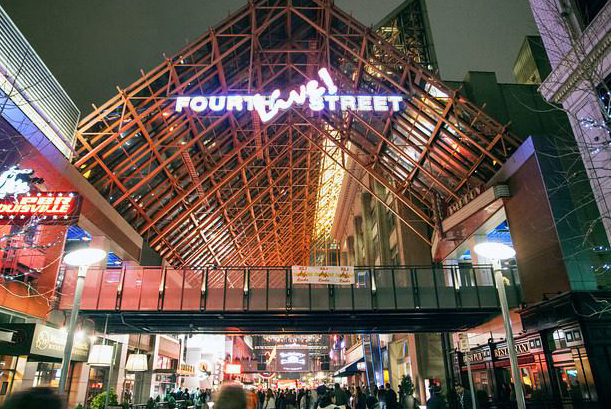 4th street live sounds really fun and also, I want to visit that bookstore! I have to admit I don't watch too much college sports, but I wouldn't say no to watching a game! :) Basically, I really really want to visit you now and when I do, can we please go to all these places?! This has been such a fun series...I've just really enjoyed reading the posts each Wednesday! I love this series this summer. I have really loved what the bloggers have shown us of their towns. I loved this one... it just looks so friendly and those horses! Beauties!